The Download Qualcomm FRP Unlock/Remove/Bypass Tool 2018 is 100% sure that available here our Website and download freely from at the bottom of the post for its official download link.Click the right download button at the end of the post and manually download them. Hello' dears today we are going to share the Qualcomm FRP Unlock/Remove/Bypass Tool 2018 from here our Website and it is download freely from at the bottom of the post for its official download button.If you have a android smartphones and have a qualcomm processor so, sometime you will need a very good tool so, that you can Bypass sometime such a google security.Now if you want to bypass any Google account or do another security unlocks on your smartphones which has a processor from this latest manufacturer, so, you are going to need a very best tool for it.Our website is the free home all latest tool for android smartphones which are available here and download free.In this article we are going to give you the Qualcomm FRP Unlock/Remove/Bypass Tool from download right now on our Web Page. If you are not satisfied and going to other website to download the latest Qualcomm FRP Unlock/Remove/Bypass Tool where they ask you to pay some handsome money for it, so, leave them right now and download it right now from our Website where we are providing you to this for free of cost. You don't pay a single penny for it.All of you need to do is to click the free download link given below of this article and get the Qualcomm FRP Unlock/Remove/Bypass Tool for your self.The latest tool has been released with its more unique features which we can also discussed here our Website. Here is the list of unique features of Qualcomm FRP Unlock/Remove/Bypass Tool given below. It is only the tool free to download and very easy to use. Support for ADB and fastboot mode. Remove FRP lock and easily in just a munits. Here is the guideline points to use the latest tool free. First of all you can download the Qualcomm FRP unlock tool applications from the links provided below. Then Extract the file after downloading. 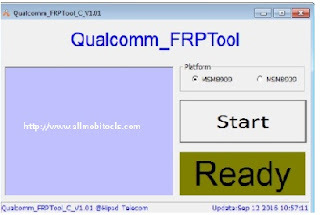 Now open the Qualcomm FRP unlock tool folder. The launch the Qualcomm FRP Unlock/Remove/Bypass Tool applications. Connect your a android smartphones Via USB Data Cable with your PC.